*Post written in collaboration with World Market. It’s the Submit Your Space design day! Before I reveal the family chosen, I want to thank everyone who took the time to photograph their homes and send me their stories. I was completely blown away. Your homes are truly beautiful. I kept telling my husband that I wanted to choose every single entry. 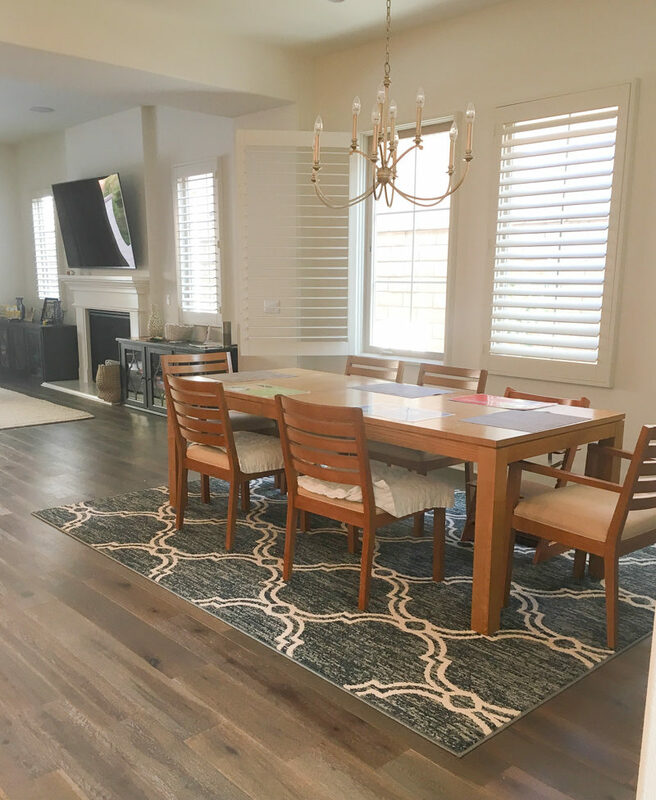 While your home may not have been selected, I hope my design today will give you some ideas for your own space and help jump start the process. 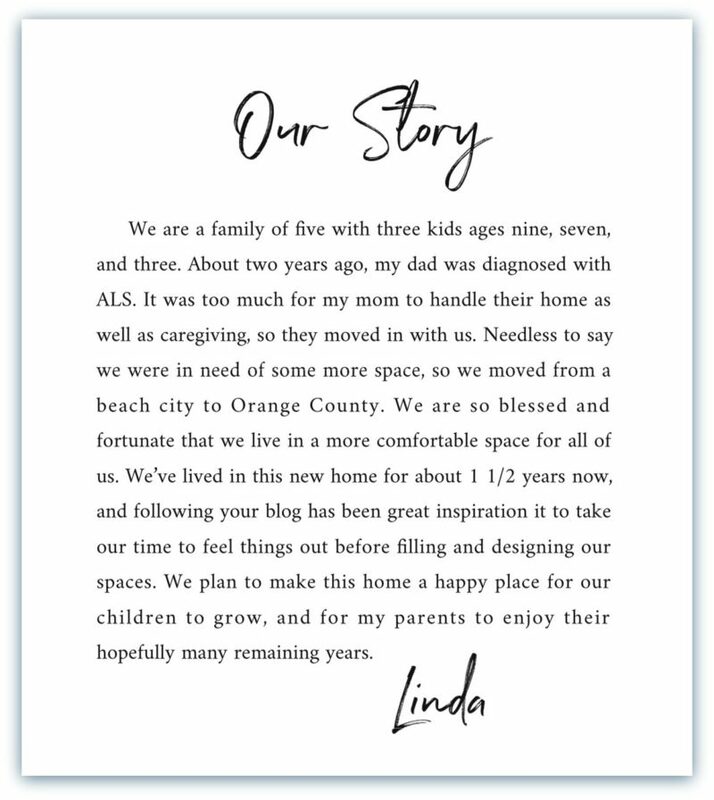 I was so impressed with Linda’s willingness to open her home to her dear parents. While my mom and dad never lived with us, I can certainly relate to helping with the caregiving and just how different life can be when faced with a diagnosis like ALS. Creating a beautiful space for three generations to enjoy makes me so happy. I love picturing Grandma and Grandpa sitting around the table sharing their wisdom with the grandchildren. Priceless. Beautiful, right?! Every home submitted was so pretty. This space is already so lovely. We just need to add some warmth and texture. The adjacent kitchen has darling navy and white barstools so I want to keep that in mind when creating a design for this space. Plus we know they have a large family and the table needs to sit at least seven. I want to create a space that feels inviting and warm. 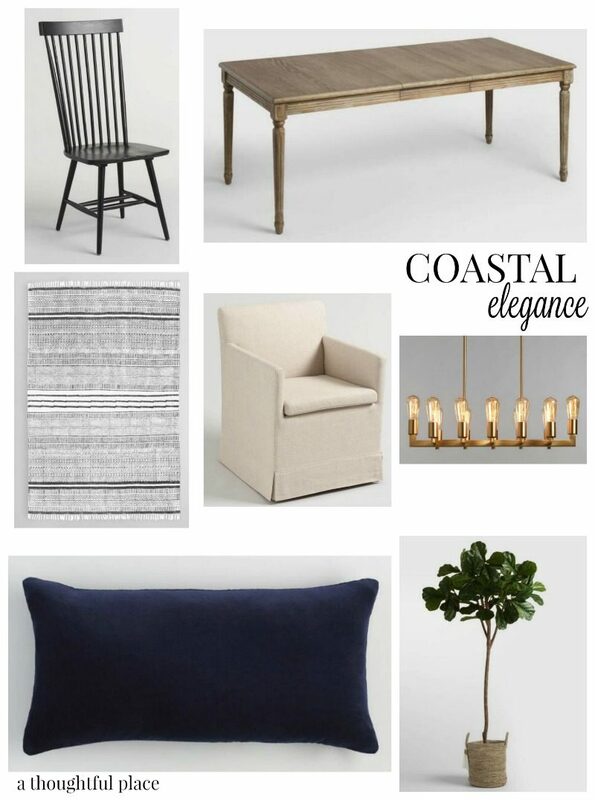 Linda is drawn to a bit of a coastal vibe so my plan is to design a room that reflects that. The problem with designing for other people is that I suddenly want to redesign my own dining room. Everything I chose is neutral but rich with pattern and different finishes. 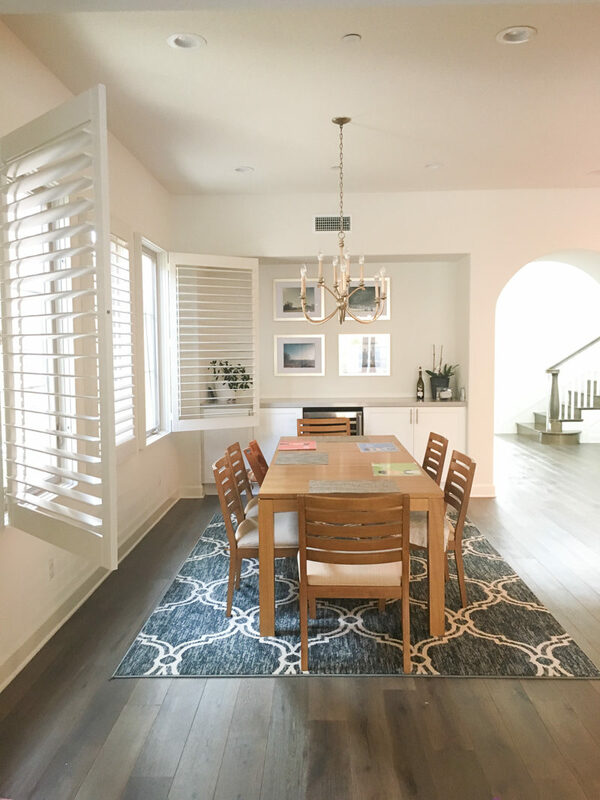 The gray and white striped rug is beautiful and offers more of a coastal feel than the current rug. The black farmhouse chairs are chic and fun and easy to clean!!!! When you have a house full of people, that is key! I like the idea of adding the softer chairs to the ends with a pop of navy on each one. I adore this table. The color is gorgeous and it has a leaf so that it can extend to 76″. The chandelier I chose is quite similar to what they have but with a cleaner, more updated look. 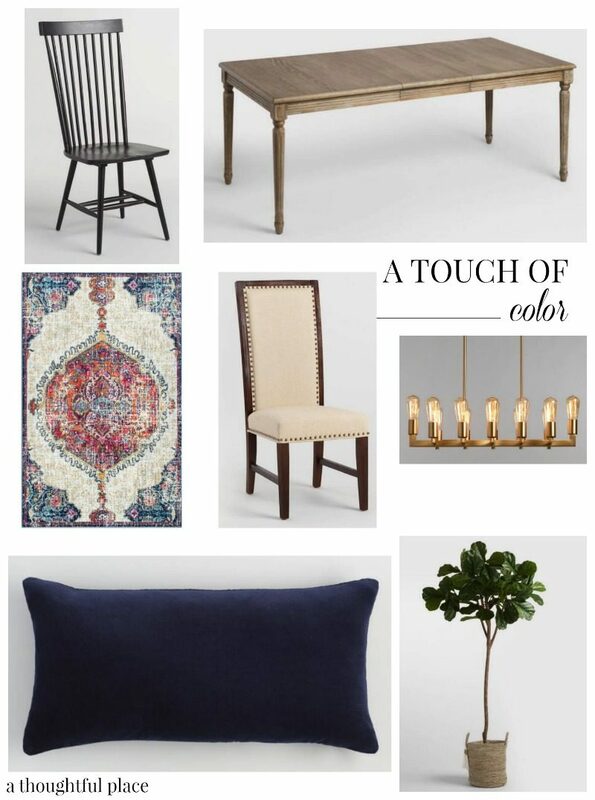 I love the brass mixed with the navy textiles. The key to creating a warm and cozy feel is layering in the accent pieces. My recommendation would be to add shiplap in the pretty bar area. It would tie in with the coastal vibe and add architectural interest. I would then add in two large vases with oversized arrangements on either side of the artwork. 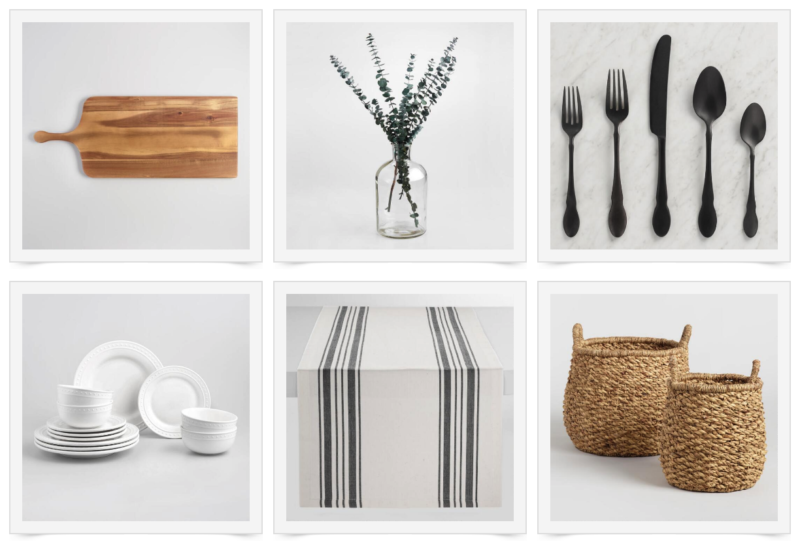 Have you seen the matte black flatware? LOVE. It looks so sharp and current paired with crisp white dishes. The fiddle leaf fig tree can be placed to the left of the windows inside one of these beautiful baskets. It will add visual interest to the space and soften the lines of the shutters. I wanted to offer one more design in case the family is up for incorporating more color. This rug is so vibrant and pretty. And the chairs would be in keeping with a traditional look. Linda, I wish you and your family all of the best and years of happy memories gathered around the table. I hope these design boards provide you with the inspiration you are looking for. And thank you to World Market for providing the family with $200 to help get the design party started! A heads up that all dining furniture is 30% off right now. Now off to spend time with mama. Enjoy your day, all. I think they’ll love your choices. That chandelier is perfect over the long table. A Touch Of Color is my favourite. 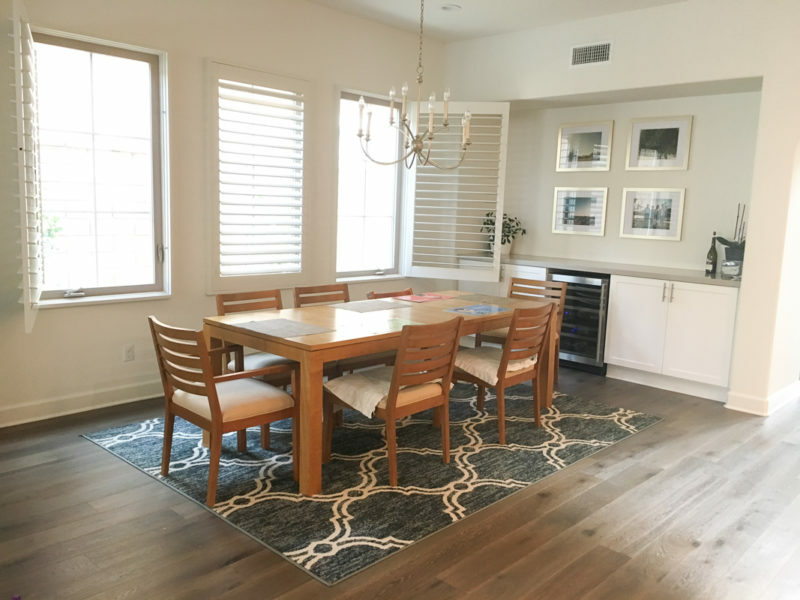 The area rug adds a touch of color and pattern, which will make the room cozy and add interest. I’m sure either will touch her heart. I’m so happy you picked Linda. A person with such a good heart deserves a little pampering. Ahhh. You’re so kind. I couldn’t agree with you more. She deserves it and I know their home is filled with so much love. Thank you for the nice words about the design, too. Wonderful ideas! I like that rug and the chairs too. Thank you so much. Enjoy your day. LOVE it! While I don’t know Linda, I think it is great she’s having her parents live with her. My 84 year old mom lives with us and it has been a blessing for all of us, even if it is hard at times because of the aging process both physically and mentally. Hope that she will post pictures of the finished product! That’s amazing!!!! I love that. And how wonderful to see the blessings that come from that. I know it presents challenges, too, so good for you.